As many of you will know I have been living in the Philippines for about 3 years now. I first visited these beautiful islands in 2006, attracted by the natural beauty and friendly reputation of the people here. With the fairly recent election of President Duterte and his infamous ‘war on drugs’ many people ask me if it is still safe to travel to the Philippines. The simple answer to that is yes but as with anywhere in the World you should keep your whits about you and follow some basic rules so that you know how to travel safely in the Philippines. The Philippines is made up of over 7000 exotic islands and almost all are what I would consider safe to travel to. 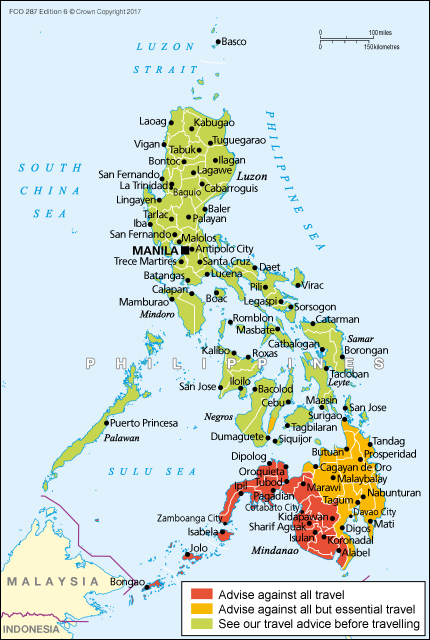 The only exception to this is the south western side of the island of Mindanao in the south around the area of Zamboanga where there is a heightened threat of kidnapping of foreign nationals by Muslim groups such as Abu Saayef. Make sure to check out your countries Foreign office website to keep up with the latest travel warnings. I live in Cebu province and as you can see from the map above even the southern end of this island is subject to a travel warning. I regularly travel in the south of Cebu province and get the ferry over to Dumaguete on the next island of Negros oriental. Sometimes there are armed guards around the port and sometimes there aren’t. When travelling int he Philippines don’t be alarmed at the sight of armed security guards, armed police and even seeing soldiers at various ports and places as this is quite normal. These people are here for your protection and as you become used to the way of life here it becomes something that you simply accept and don’t notice in every day life. I can honestly say (coming from a fairly normal UK city) that I feel safer in the Philippines than I do on a Friday night in the city centre of most UK cities. I have never once got in to trouble with a local and by and large the people here are incredibly friendly, respectful and hospitable. I was living here before Duterte came in to power and nothing has changed on the ground in terms of everyday life. If you do as you would do in your own country and stay away from drugs, avoid drinking heavily and act respectfully towards people then unless you are very unlucky you should not have any trouble when travelling in the Philippines. The few problems I have seen are in my mind usually avoidable. ie guys get into fights when they are drunk at 3am in the morning and wander in to the wrong part of town. Well that could be true of any country that I have ever visited. Here are a few basic tips to minimise the risk of getting in to any trouble when you are here. When you arrive (presumably at Manila) be aware that as a foreign tourist you will be targeted by taxi drivers as you exit the airport. Some of these guys are trying to take advantage of the fact that you are new here and don’t know the cost of getting to your hotel or destination. They will try and charge you 1000 pesos for a journey that when metered is only a couple of hundred pesos. The easiest way to avoid these guys is to simply say no thank you I will get a metered taxi. Once they realise that you know this is an option they will usually move on to someone else. The metered taxis all line up outside the airport and you will know where they are because all the Filipinos get them. If you are unsure just ask one of the many guards and they will show you. The nicest areas of Manila are BGC (Bonifacio Global City) with lots of expats , restaurants and a very safe atmosphere. In particular Mckinley Hill is lovely. Makati which is the business district, offers lots of high end accommodation and again is pretty safe. Don’t look like a victim and you are unlikely to be one. Be confident when in the Philippines because most people will be happy to help you to find your way around. Don’t show off your expensive camera, watch, jewellry etc. This goes without saying when you are visiting any country in my opinion and is just common sense. If you don’t show your wealth then you will not attract the attention of thieves and pickpockets. Use some of the local language and you will immediately find that Filipinos open up and are happy that you made the effort to learn a little bit of their native tongue. Smile and throw in a few words of Tagalog (in Manila) or Bisaya (if in the Visayas) and you are already seen in a more favourable light compared to English only speakers. Whenever I jump in a taxi I always greet the taxi driver with muxta po (in Tagalog) or muxta Kuya (Bisaya) (both pronounced Musta) meaning how are you brother or friend. This has two benefits. It shows that you make the effort to know a little of the language and it also makes the taxi driver aware that you perhaps know a little of the language and culture. In turn this makes them less likely to try and rip you off. In the Philippines as a foreigner you will often be offered an alcoholic drink by locals wanting you to join their group. Smile have fun but don’t drink what they offer you unless you know these people or are with a local friend who knows them. In general it is most likely harmless and simply a kind offer of hospitality. However there are 2 reasons why I don’t like to do this. First is that you don’t know what is in that drink you are being offered. It may be drugged (highly unlikely but still). Secondly if you get drunk with a bunch of guys that you don’t know then it may just be tempting for them to relieve you of your money, wallet, valuables. In Cebu smile and say dli ko, salamat (I dont want it, thank you). Just be pleasant and make light of it and you will always get a smile back. Don’t overpay for things in the Philippines. Yes everything can seem cheap when you come here but remember that you will be much more respected by Filipinos if you pay the going rate for something than if you keep getting ripped off. See what the locals pay and if you are feeling generous add a small tip. For example if someone helps you to carry your bags from the taxi to a bus etc a Filipino might give a 5-10 pesos tip. If you pay over the top for everything then you put the price up for local people. Don’t give money to beggars. They are often part of a gang working the streets. They will carry babies, make hand gestures as if to say I need to feed my baby and basically do anything to make you feel guilty. I never give money to beggars because once you do (and this has happened to me) a whole load more will suddenly appear as they tell their friends that foreigner just gave me x amount of money. If i like the person and they seem genuine I will buy them something to eat. Just use your common sense and don’t do something or go somewhere that you wouldn’t when in your own country. That is easily the number one piece of advice here. Use your instincts as they are normally right. If you wouldn’t walk down a dimly lit street at night in your home town then don’t do it here. Most of all when planning your trip to the Philippines if you stick to the above advice and use your common sense then I am sure that you will have a fantastic, safe trip. It really is a beautiful country and the people rightly have a reputation as among the most friendly and hospitable in the World. As I live and work here this post is the first in a series of blogs that I will be writing about the Philippines. Upcoming articles will include some of the best places to visit along with blogs about my families travels here. I would love to hear any tips from you about travelling safely in the Philippines or anywhere else. Have you already visited the Philippines or maybe you live here and have some great tips for other readers. Please add them to the comments below.